Heat oven to 400°F. Spray 9-inch pie plate with cooking spray. In 12-inch nonstick skillet, cook beef, bell pepper and onion over medium-high heat 8 to 10 minutes or until beef is browned and vegetables are softened; drain. Wipe out skillet. Return beef mixture to pan; add taco seasoning mix and water. Cook and stir over medium-high heat 1 to 2 minutes or until well mixed. Remove from heat. Cool 2 minutes. Meanwhile, in large bowl, mix milk and egg. Stir in cheese. Stir beef mixture into egg mixture, then pour into pie plate. Spread evenly. Top beef mixture with Tater Tots™. 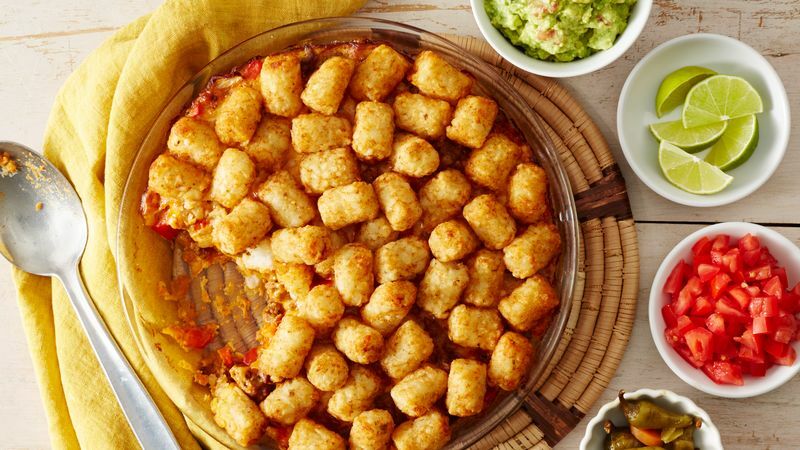 Bake 37 to 39 minutes or until mixture is set and Tater Tots™ are browned. Cool 10 minutes. Top with fresh toppings, as desired. Like it hot? Use shredded pepper Jack cheese in place of the Mexican blend. Go crazy with the toppings! From sliced ripe olives to pickled jalapeños, feel free to add as much as you like to make it your own.